In 1933, Japanese inventor, Ukichiro Nakaya, managed to create the first man-made, artificial snowflake. By building a chamber in his laboratory that could adjust temperature, humidity and pressure, he was able to recreate the weather conditions which, in nature, produce snow inside clouds. 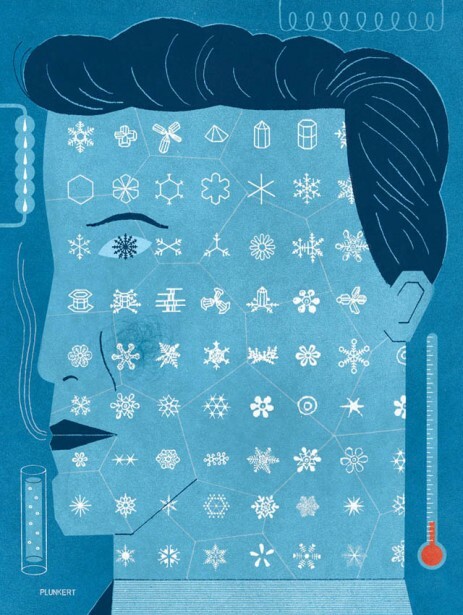 Ukichiro, who was recently portrayed by illustrator and Altpick member, David Plunkert, as part of the “Way Passed Future” series in Wired Japan, also created the system that was used to classify different types of snow crystals.